Please note: This course is a supplementary program for Fritz8 and can only be run if the chess program 'Fritz8' or Fritz8-WCh Edition (orlater versions)- or one of the programs in the "Fritz Family" (Junior 8, Hiarcs 9, Shredder 8, ChessTiger 15) is installed on the PC. 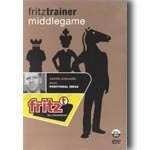 Neither Fritz8 nor Fritz8 WCh-Edition is supplied with this training course. An additional file for multi-media programs may also have to be downloaded from playchess.com (the ChessBase playing server). The file is free. Very important: you have to install Windows Media Player 9 on your PC.